Haynes Family: "One of these days these boots..."
"One of these days these boots..."
Jaeden has been wanting pink cowgirl boots for months. Yesterday we went and bought them and she was so excited. Last night she even slept with them; not on, just holding them. 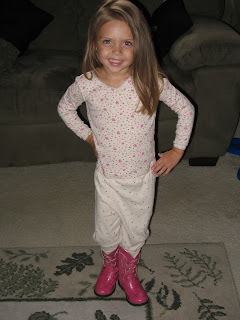 We think she looks pretty cute, especially when she refers to them as her "yeehaw cowgirl boots". That is really cute! And Jayden is so beautiful! That's so cute! I can't believe how big she is. We need to get together.